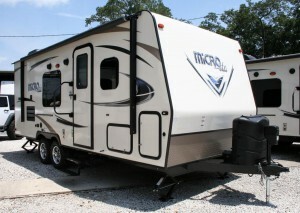 Buying a travel trailer in a budget can be one of the most time-consuming decisions to make. Mostly because of the sheer amount of choices available, and then having to check the camper in person before deciding on a purchase. Because you’ll be taking note of the budget, we’ve made the browsing part easy for you. 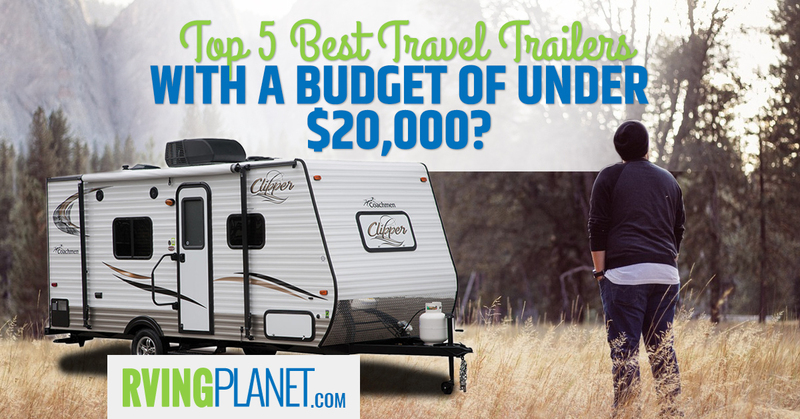 Read on to discover the top 5 best travel trailers under 20,000 dollars! What puts an RV on the list: You’ll be surprised to see that you’ll still have more than 80 travel trailer brands to choose from after applying the budget filter. 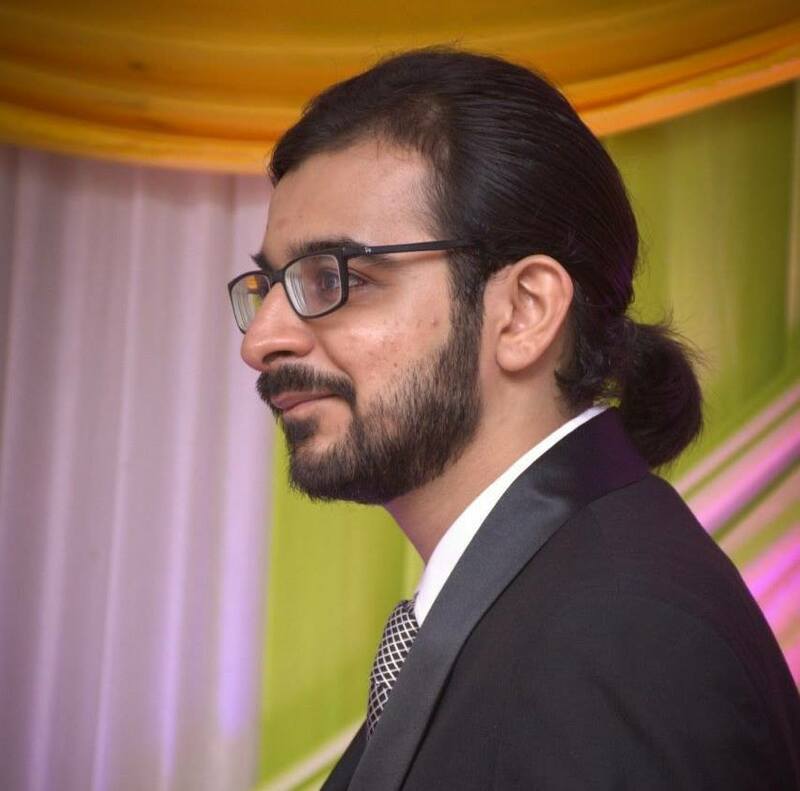 However, we’ve hand-picked our choices from great user and critic reviews, the features they have, and the number of floorplans they offer to provide you with a variety of choices. 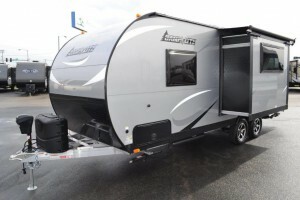 Why we recommend the Forest River Flagstaff Micro-Lite travel trailer: This isn’t the first time that the Flagstaff Micro-Lite has made it to our list. It has consistently proven itself to be the best in more ways than one. It’s under $20,000 on our website right now, which is a steal when considering how many features are available. 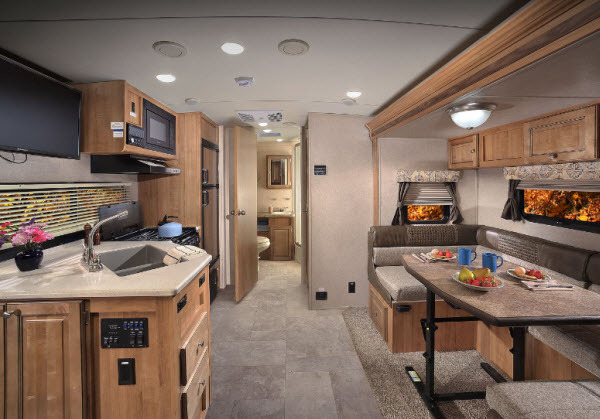 If you can’t decide which RV the best one for you just by looking at one model, there are 17 different floorplans that have a variety of the overall weight, sleeping capacity, and length, so you’ll be able to find your dream RV in the Micro-Lite. While we recommend checking out the Flagstaff Micro-Lite 19FBS and the Flagstaff Micro-Lite 25FBLS, the other floorplans share the same features amongst one another. 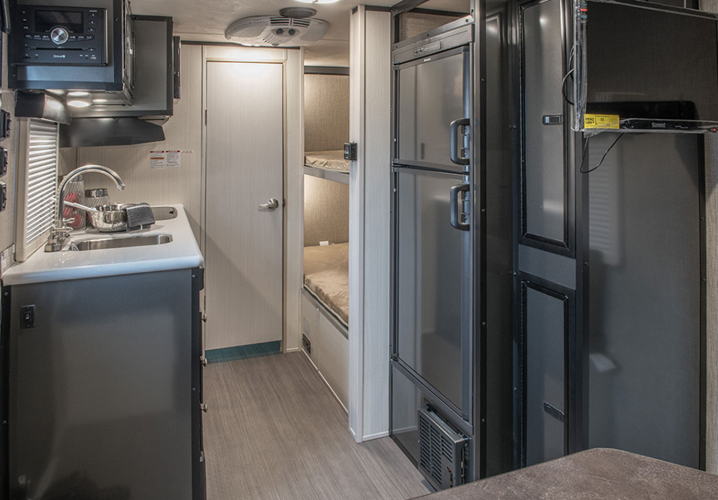 Some of the key features can be found below, but there are other noteworthy ones, including the ducted furnace, mounted 24/32-inch TV, premium soundbar, laminated fiberglass sidewalls, among many others! 17 different floor plans available! 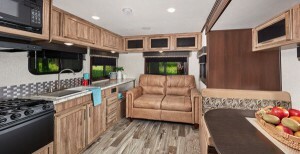 Why we recommend Coachmen Freedom Express travel trailer: Durable is what describes the Coachmen Freedom express travel trailer best. Its 26 floorplans have a footprint ranging from 22 to 36 feet, with sleeping capacities going from the small family of 4 all the way to a big family of 10. Depending on the floorplan you choose, you can either easily tow this travel trailer with a mini SUV, or some require a regular truck to tow those 5000+ pound travel trailers. We liked the Freedom Express 292BHDS and the Freedom Express 28.7SE in particular due to their sleeping capacity and their decent length, but feel free to check out the others too. The features do not vary as much, sporting interior speakers, amber patio lights, fully walkable roof, and many others. If you wish to upgrade this bad boy down the line, you could do so through upgrades and additions such as 15,000 BTU air conditioner, Candian compliance, and an 8 cubic feet refrigerator. 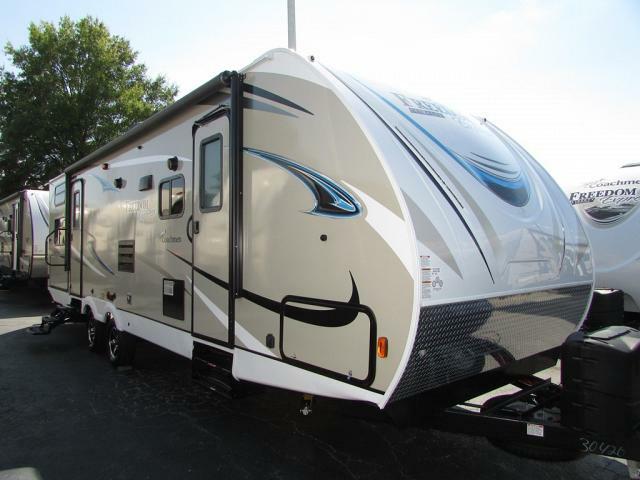 With these great features, we would recommend this RV to anyone! Why we recommend the Livin Lite Camplite travel trailer: We’ve lost count on the amount of times the Livin Lite’s Camplite travel trailer has made it to our top 5 lists, and for good reason. This sub-5000 pound RV comes in 9 different models, maintaining the lightweight towability and its relatively small footprint. We recommend checking out these 2 floorplans: Camplite 16BHB and the Camplite 21BHS. Apart from the 5 awesome features you’ll notice below, the other amenities of the Camplite include the 6 cubic feet double door refrigerator, the overhead cabinets, and the slideout topper awning. 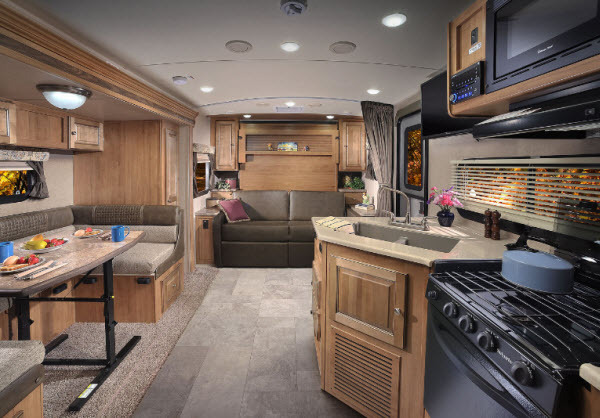 If you want to upgrade to extreme luxury for this RV, you can do so through the various expansions provided–such as a power awning, an LED TV, compliance with Candian RV standards and more. The Sub-7000 lbs Versatile Beauty! 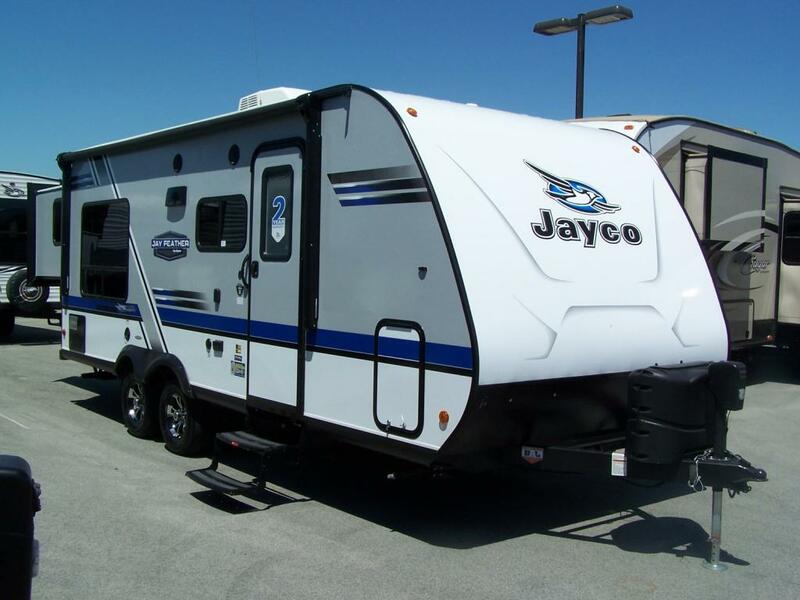 View All Jayco Jay Feather Travel Trailer Floorplans! 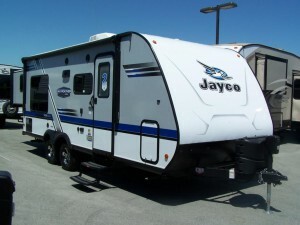 Why we recommend the Jayco Jay Feather travel trailer: Jayco’s Jay Feather is aptly named. The slightly larger weight of the Jay Feather adds to the durability of the RV. 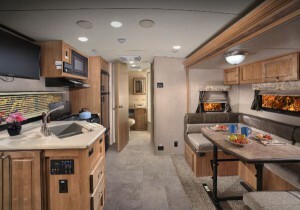 You get 8 different floorplans and quite an extensive maximum sleeping capacity of 10 people. 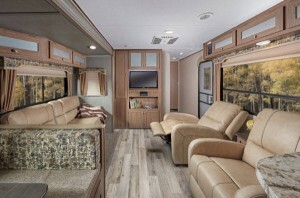 It’s also accompanied with a 35-feet length so there’s enough space for everyone to stay comfortable. Check out the Jay Feather 23RL and the Jay feather 25BH in particular. 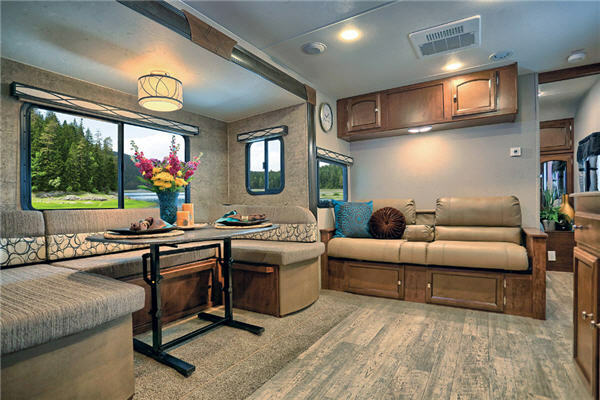 You’ll be surprised to see that for a sub-20 grand travel trailer, the Jay Feather has a few features that one would consider premium. It provides marine-grade exterior speakers, tinted safety glass windows, and impact resistant wheel wells. 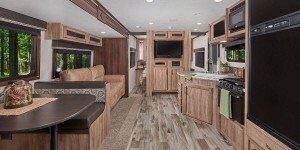 There’s a mandatory customer value package bought with this RV that includes some necessary features. It also offers optional features and expansions, such as an upgraded air conditioner and an electric tongue jack. All in all, the Jay Feather is a great choice for an RV under $20,000! 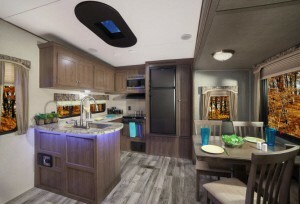 View All Keystone Hideout Travel Trailer Floorplans! 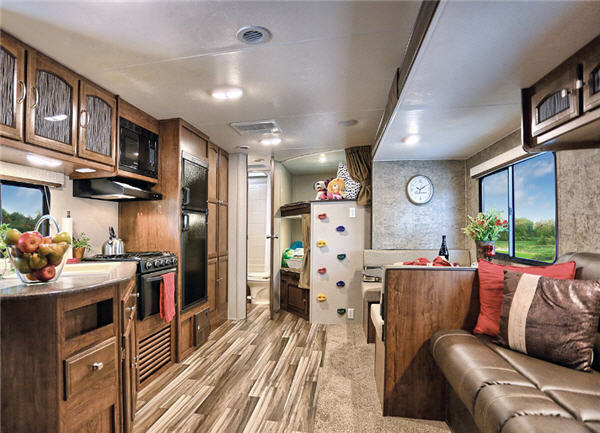 Why we recommend Keystone Hideout travel trailer: If you’re thorough when looking at RVs to find the perfect one for you, it’s safe to say that the Hideout has something that’s just right for you out of its 44 floorplans. 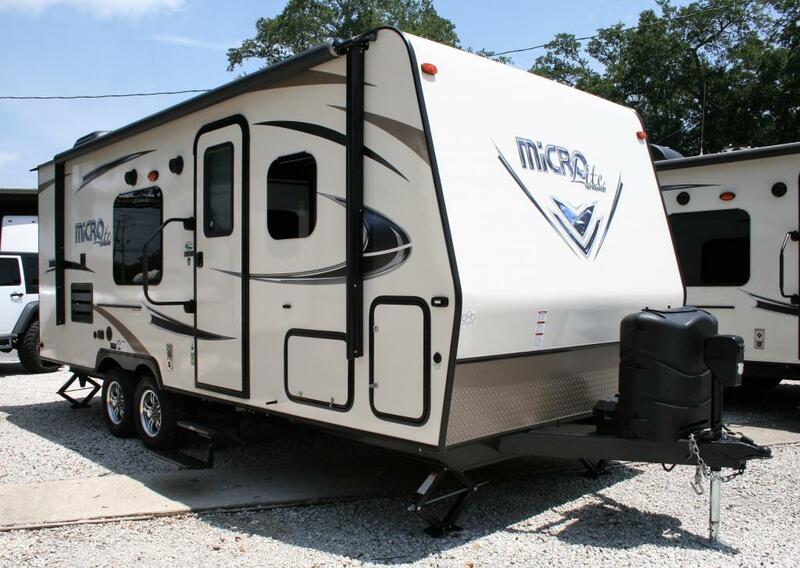 These cover a variety of weights, sleeping capacities, and lengths which truly makes it one of the most versatile travel trailers out there. We recommend taking a look at the Hideout 212LHS. The Keystone brand has also been featured in our Top 5 Best Cozy Fifth Wheel Campers for Winter. Here, the fifth wheel RV impressed us with its 12 cu ft refrigerator, 50-inch television, memory foam mattress, cell phone charging station and other features that regular consumers might find interesting. For those who are into the specifics, the Keystone does provide options for a 6-point electric auto leveling system and Onan Marquisg gold 5.5 KW – LP generator. 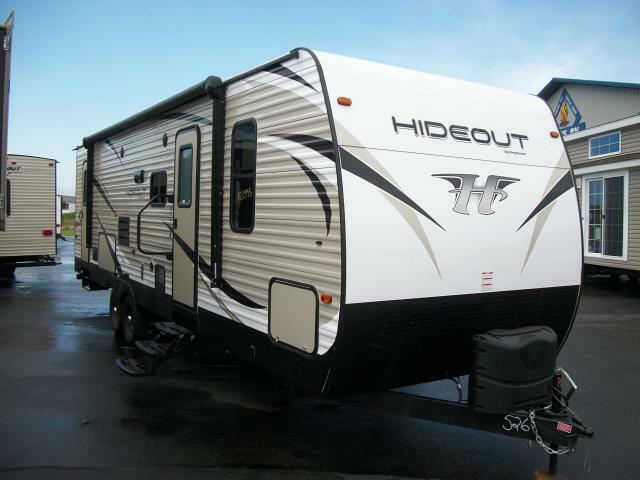 While the sheer amount of floorplans is nothing short of impressive, it’s not the only thing that the Hideout excels at. The feature list covers everything you could ever need from a travel trailer and then some at a price point which is quite affordable. If you’re looking to upgrade its features or add some extras, it has a long list of available options as well–some of which include a tri-fold sleeper sofa, freestanding dinette, spare tire, 15,000 BTU air conditioner and more! At the end of the day, a good research of individual travel trailers combined with comparing prices of individual dealers can help you get that perfect travel trailer for you. But if you wanted to know which are the best of the best under a 20,000 dollar budge, you’ve got the list right here! 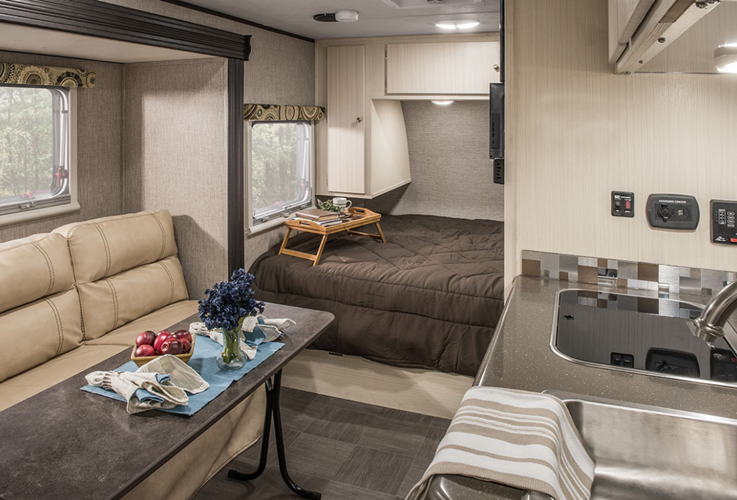 Share with us your favorite travel trailer under 20000 dollars in the comments below!